We’ve written recently about AC Milan’s preference for all-white kits in European Cup and Champions League finals, so much so that they created bespoke outfits in 1989, 1990, 1994 and 1995. 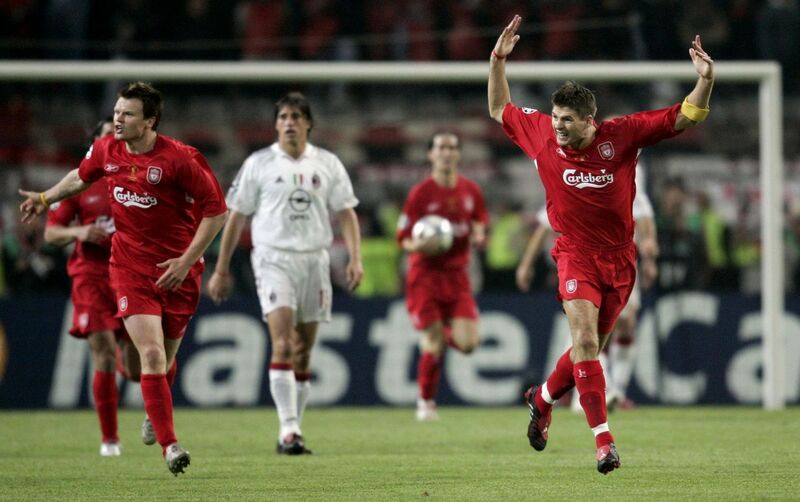 The last time that the rossoneri were continental kingpins was a decade ago, when the all-white worked its magic against Liverpool in the final, unlike two years previously. Earlier in that campaign though, they appeared in a look that was quite unusual for them. 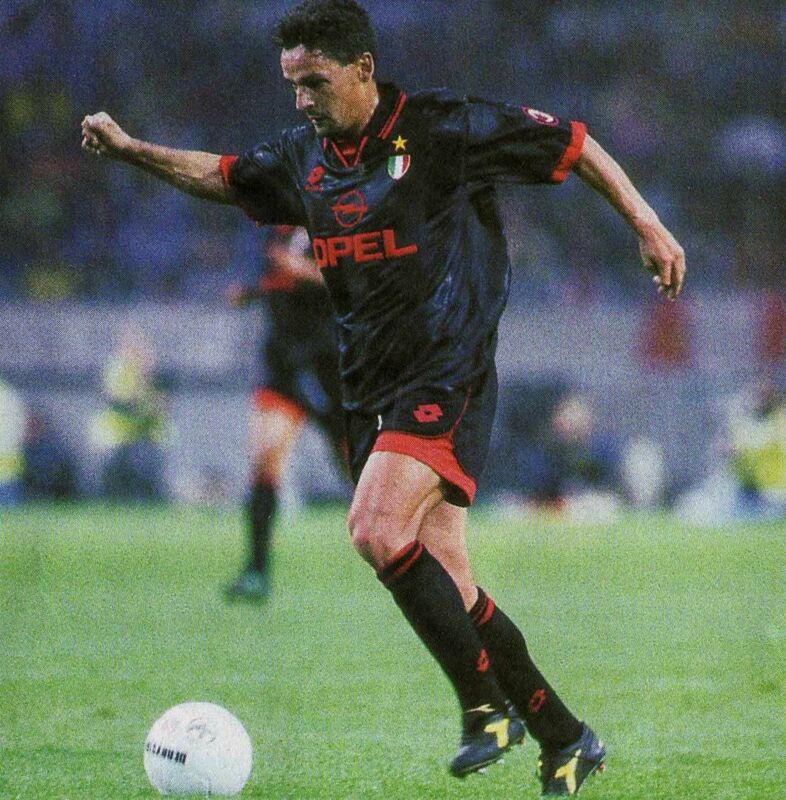 While shorts and socks clashes continued to be allowed in Serie A until the early 90s, in Europe Milan had begun to wear black shorts and socks with their home shirts when the need arose, with white socks having replaced black as the first choice in the late 80s – some attribute this to Ruud Gullit but we haven’t yet found proof. 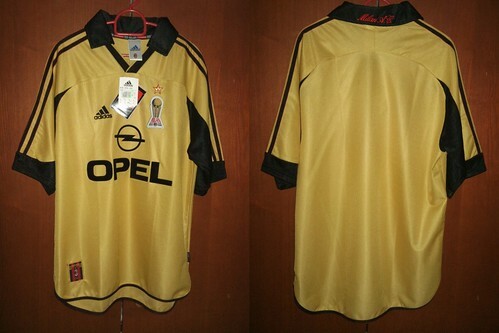 The change kit remained sacrosanct, and a series of third and fourth kits were worn rather than sullying it with dark shorts, while a meeting with Paris St-Germain in 2001 provided the only example of socks being swapped. When Milan were drawn with Manchester United in the Champions League in 2005, they wore all-white in the away leg as their hosts switched to black shorts and socks, despite the fact that they had a gold third kit available. Two years later, however, they were paired with United again and, though they were in third of what would prove to be eight straight seasons with a black third kit, this time they modified the away, mixing it with the third kit shorts and home socks. After Cristiano Ronaldo put United ahead with an early goal, a brace from Kaká gave the visitors the lead. Even though Wayne Rooney equalised and then got an injury-time winner, a 3-2 defeat was far from a bad result for Milan and they triumphed 3-0 at home. As luck would have it, the following season they would don a similar look in England, away to Arsenal in the last 16, drawing 0-0 at the Emirates Stadium before losing 2-0 at home. In more recent times, games at Bologna have seen changes at Bologna, initially red shorts and white socks but more recently black shorts.